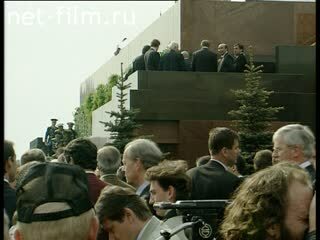 Foreign guests at the Lenin Mausoleum on Red Square. With Mausoleum down Luzhkov, I.Rybkin, warlords. On Red Square are tourists, war veterans and other participants of the event. Machine "first aid" on Vasilevsky descent.